Nairn Access Panel Chairman Seamus McArdle at the new crossing point on the busy High Street in Nairn. Nairn residents are “delighted” as work gets under way on a town centre pedestrian crossing with lights that will make it safer for people with disabilities or just a slower pace, to use the road. The crossing, on the High Street, will put pedestrians first, and the work is seen as a win for the town’s access panel who campaigned for changes to the crossings on the road. 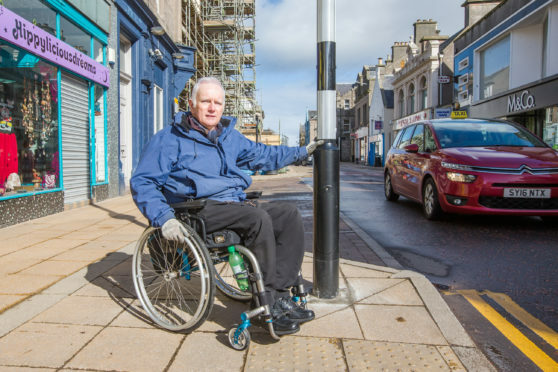 One access panel member told the Press and Journal it will make it much easier for people in wheelchairs, using sticks or slow walkers, to use the road – the B9090 through Nairn town centre. Highland Council, who are undertaking the work, said the pedestrian crossing on the High Street aims to provide a safer environment outside Nairn Courthouse. At the pedestrian crossing, bollards will be installed and crossing lighting installed after scaffolding has been dismantled and removed from renovation works at the courthouse building. Councillor Tom Heggie, chairman of the council’s Nairnshire Committee said: “Pedestrians will be given priority with the introduction of this new crossing. “Nairnshire councillors agreed to proceed with the crossing after consultation with the Nairn Access Panel. “The members were delighted to work with the access panel to provide an additional safe crossing for people in the High Street. Members were recently given an update on the courthouse renovation works including an overview focusing on the need to address structural integrity matters of the property; the acceleration of the project start to enable scaffolding to be erected early to address the structural works; and the 48 week programme including the removal of the spire which take place during July – August. Presentation boards about the renovations works will be made available for the public to view in the next few weeks. As part of the works, the council is having the steeple clock removed by specialist contractors for protection, stored, serviced and restored at the end of the project.